War-date Union soldier Autograph Letter Signed by N. Wilcox, 3pp. 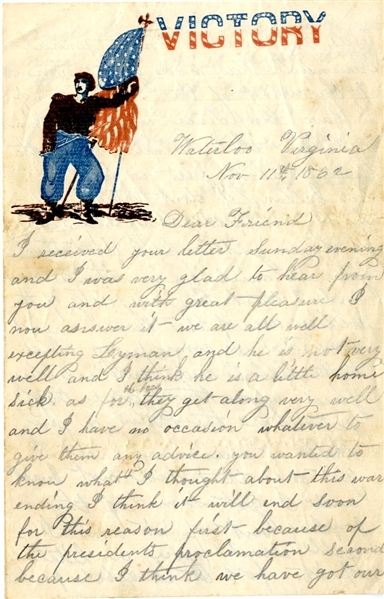 octavo,pencil, on “VICTORY” letterhead, Waterloo, Virginia, November 11, 1862, and reads in part: “...I thought about this war ending I think it will end soon...because of the president’s proclamation...I think we have got our rebels generals about out. General Burnside has now got command of the Army of the Potomac and I have confidence enough in him to believe that he will hurry the business along fast as for McClellan I dont think he drives business along as fast as he might...I think the majority of the soldiers of the same mind. Yesterday we came pretty close to the Rebels and our artillery fired upon them and they retreated they threw a few shells at our men and I got one that did not hurt and I got some of the powder out of it and I will send you a little of it, for it is rebel powder...” Very good condition.